THE descendants of Satyanand Stokes — grandchildren, great grandchildren, cousins, spouses of direct descendants and the extended family converged to celebrate the centenary of Harmony Hall, the house that Samuel Evans Stokes built in 1912. On October 14, 2012, Baro Bagh (PO Thanedhar) in the upper hills of Himachal Pradesh, at an altitude of 7,500 ft and about 82 km from Shimla, was abuzz with activity. With a charming mix of local architecture in the sloping slate roof, wooden beams and dressed stone, and in harmony with western influences such as high chimneys and big windows, Harmony Hall is an architectural delight. Besides the cousins, grandchildren and great grandchildren, members of the extended family and three villages with associations with the Stokes family were also invited. Besides sending out invitations, Vijay Stokes had to make catering arrangements. Local women were invited to cook typical Pahari dishes for the first two lunches. 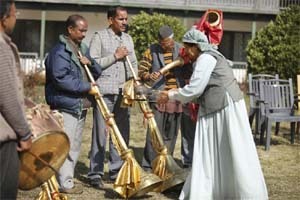 Outdoor toilets were constructed, a Pahari baja (band) arranged, and experts invited to demonstrate different Pahari dances. 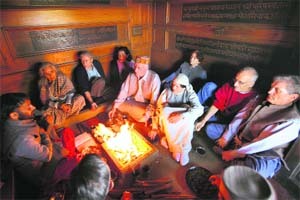 Among the highpoints of the celebrations were the good vibes generated by the havan performed at the Paramjyotir Mandir. The Pahari-style temple in Baro Bagh, built by Stokes on a ridge above Thanedhar, has a havan kund and carved inscriptions from the Upanishads and the Bhagavadgita on the walls. The family-wise formal introductions of different branches of the family was appreciated, especially by the fourth-generation members. Each unit stood up and introduced each individual member. A "quiz" session on the family history was held. The members of the extended family were received in a traditional manner. The Pahari nati, had to be performed, accompanied by a Pahari Baja (band) after lessons. There was also a reception for three villages associated with the family. Tours were organised to familiarise visitors with Harmony Hall, the Tara High School, and the cave in which SN Stokes lived for some time. Asha Sharma, Stokes’ granddaughter, has written a biography of Stokes, American in Khadi. Milan Moudgill, a greatgrandson, read out a moving passage from it, describing Stokes helping a child dying of small pox. Faces and names were linked and emotions heightened as love and energy flowed. 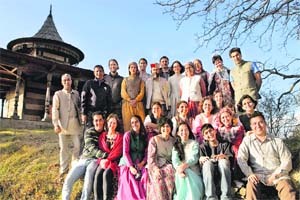 Many fourth-generation members began as "strangers" and parted as friends after the reunion. Shamona Stokes, a graphic designer, a fourth-generation Stokes from the US, says: "I’ve heard many mythic stories about my great-grandfather, so he felt more like a historical figure than an actual person in my family." After visiting the cave where he had lived, seeing actual footage of him reading prayers in an old family film, and hearing other tidbits gleaned from different relatives, humanised him and made his legacy personal. Brij Mohan Sirkek, an orchardist, the youngest cousin (Number 29) of the second generation, is of the view that this first family gathering has given the ‘Western cousins’ a greater insight into the connotation that the word ‘family’ has for most Indians. For Chandigarh-based Dr Jyotsna, (a great-granddaughter) it was a walk down nostalgia lane, since she spent all her vacations at a house adjoining to Harmony Hall, in Baro Bagh. Milan Moudgill, a graphic designer, the official photographer for the event, too recalls how in school (between 1975 and 1985) most of his two-month-long summer vacations were spent with his grandparents Shakuntala and Prem Chand Stokes (the eldest child of SN Stokes). To the youngster, aware of the large family spread across India and abroad, cousins, uncles and aunts were no longer just names. Connections became clear. They are in touch regularly, thanks to Facebook and social media. It was a reunion that linked them to their roots and all of them will cherish the bonding that resulted from this event and cement it. There is also a proposal to hold mini-reunions near their geographic locations or make it a five-year event. At the Nehru Memorial Museum, there is a painting of Satyanand Stokes (1882-1946), alongside other luminaries who fought for India’s freedom from the British yoke. The firstborn of a Philadelphia Quaker family, he was named Samuel Evans Stokes Jr. His father was the founder of the Stokes & Parrish Machine Co, one of America’s first major elevator firms, which later merged with Otis. 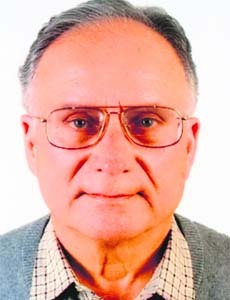 Inspired by Carleton, a doctor working with leprosy patients in Subathu, he volunteered and at 21 left for the hills. In 1912, he married a local woman Benjamin Agnes and they had seven children. In 1916, he introduced American Red Delicious apples to the Himalayas, forever changing the local economy. In 1924, he began a school to educate his children and those of local farmers, emphasising the education of girls. In 1932, he and his family converted to Hinduism and named himself Satyanand. He led a successful fight against the begar system, under which local rajas and the British exploited the poor, uneducated hill people and forced them to provide free labour. Stokes Sr offered his son $500 annually for five years. He was sure that Samuel would return and take over the family company but that was not to be. 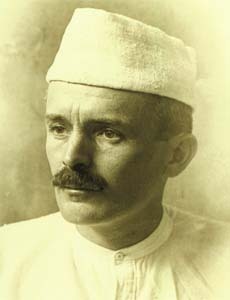 Stokes joined the struggle for India’s Independence and became the only American member of the All-India Congress Committee. His arrest by the British for "seditious" activity (incidentally, sedition involved writing articles in The Tribune) found mention in Gandhi’s Young India. Stokes was the only American to be ever imprisoned by the British. His life epitomised the firm conviction that, "The struggle for right and fair play in the relations of men is a fight worth fighting." I was born and brought up in Harmony Hall in Baro Bagh, the one place I call home and where I feel most comfortable. While growing up I shared a close relationship with our very large extended family. These bonds extended to the surrounding villages. Centennial planning was initiated in 2002, after I learned that the construction of Harmony Hall began in 1912. In response to my cousins asking for advance notice for the celebrations, I would say that I was giving them 10 years' notice! After March 2011 I sent draft programmes to the grandchildren and great-grandchildren of SN Stokes. Much effort went into tracking e-mail addresses, telephone numbers, and in responding to a large number of queries. Mores of the society we grow up in affect us profoundly. For me it was a society with a rich language, the phonology of which is more complex than that of Sanskrit, and a wonderful tradition of three musical and three dance forms. With Hindi becoming the medium of instruction, and the surreal cultural values shown on TV, this culture will soon become extinct. It should be preserved. Both the state and the Centre are apathetic. Hopefully, the public will catalyse a movement for documenting their local cultures. SN Stokes had 29 grandchildren, 60 great-grandchildren and 49 great-great grandchildren. Of these, those surviving are 24, 57 and 48, respectively. From these three categories, 22 grandchildren, 35 great-grandchildren and 9 great-great grandchildren attended the ceremony. In addition to these, 28 spouses also attended the reunion. This, however, does not include the members of the extended family. The oldest grandchild (Number 1 of 29) is Dr Uma (Stokes) Singha. The oldest grandchild (Number 5) named Stokes is Vijay Stokes. His father, Prem Chand Stokes, was the eldest son of SN Stokes. Congress leader Vidya Stokes, the wife of Lal Chand Stokes, the youngest son of SN Stokes, too attended the reunion despite a hectic election schedule in October.